A trip from the Black Sea region in Russia to the Latvian border roughly equals the distance from Berlin to Athens. While it seems like a huge distance, it's just a small portion of this vast country. However, from the beaches of Adler to the forests of the Pskov Region, it's large enough to get a taste of the real Russia. “If you’d never visited Tula, you wouldn’t have sampled the Pryanik (gingerbread),” says Igor, a friendly man from Ukraine. We have been standing for 15 minutes in line to visit the Museum of the Tula Pryanik. I’ve just explained to Igor my reasons for being in Tula. I need to get my car back to Europe from Sochi (to avoid future custom's difficulties) and am unable to cross his homeland due to the conflict there. “Why not use Belarus?” he asks. “They can’t issue visas in Rostov-on-Don, so I’d have had to go to Moscow and wait three days, which would have defeated the purpose,” I reply. “Is there no southern route?” an increasingly exasperated Igor queries. “Surely there is a ferry?” he asks. There is actually. It costs $600 to take a car and driver from Sochi to Trabzon in Turkey. I was prepared to pay this sum, but on the appointed day of travel the ship mysteriously turned around and returned to Turkey without passengers or cargo. The port workers claimed that there were issues with the vessel's registration documents. So, ultimately there was no option but to take what turned out to be a fascinating road trip from Russia’s Black Sea region to its northwestern border with Latvia. On the third leg of the trip I’ve left Voronezh and turned off the M4 highway near Kireyevsk (Tula Region). This followed an overnight in Yelets, a dusty town in Lipetsk Region known for its handmade lace. There I stayed at the Basilik Hotel (ul. Mira 88/17), paying a very reasonable €25 for a double room. Now, I’m at the Museum of the Tula Pryanik (ul. Oktyabrskaya 45-46), immersed in the world of gingerbread. It truly is the king of sweet food products. For 150 rubles ($2.20), I take a 20-minute tour to learn more about this four-century old tradition and leave with a large slice of gingerbread in the shape of Russia’s national coat-of-arms. It’s a very fair deal. Tula is also famous for samovars, the heated metal containers traditionally used to heat and boil water. For centuries Russians have gathered around these objects to drink tea and Tula has been the Russian center of its production since the 18th century. There's a museum dedicated to samovars on ul. Mendeleevskaya 8. I next ventured to Yasnaya Polyana, the estate of the legendary writer Leo Tolstoy. For 200 rubles ($2.90), I was allowed to take part in a Russian-language excursion. There are English language guides but this tour is more expensive and must be booked in advance. Tolstoy is buried here and his grave is a 15-minute walk through the woods from the main house. The residence itself is immaculately preserved, as though the author of “War And Peace” could be back any minute. At the adjacent cafe, I enjoyed a hearty bowl of borscht and debated with some Russian visitors on who was the greater writer, James Joyce or Tolstoy? We eventually agreed to disagree. Tula had been an unexpected gem, and I headed toward Vyazma where I joined the M1 highway leading to Smolensk. 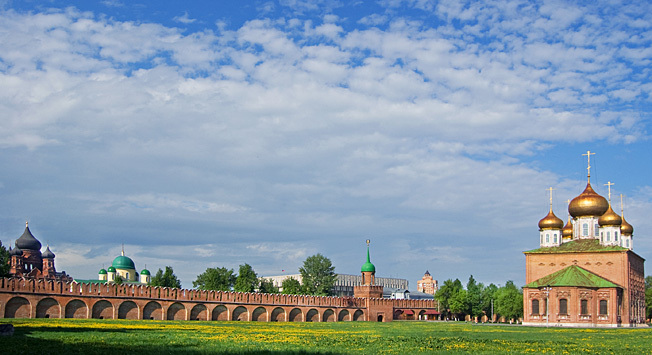 Smolensk is one of the oldest Russian cities, dating back to the time of Kievan Rus’ in the ninth century. A major attraction is Svirskaya, the Church of St Michael the Archangel (Parkovaya ul. 2), which has stood since 1197. Due to the region’s history it’s a miracle that the structure not only stands, but that it is completely intact. Inspired by Tula, I had dinner at the aptly named Samovar (ul. Lenina 14). Here, for a mere 300 rubles ($4.35), I enjoyed wholesome pirogi (pies) and blini (pancakes), washed down with a Sibirskaya Corona beer. The next day, I encountered an unexpected toll road (100 rubles, $1.45) from Usvyaty to Nevel nestled against the Belarus border. After that I joined the Minsk-St. Petersburg highway and later connected with the one from Moscow to Riga. This is the final episode of the three-part series, where we followed Irish journalist Bryan MacDonald's road trip from the Black Sea in Russia's south to the Baltic Sea in the north.